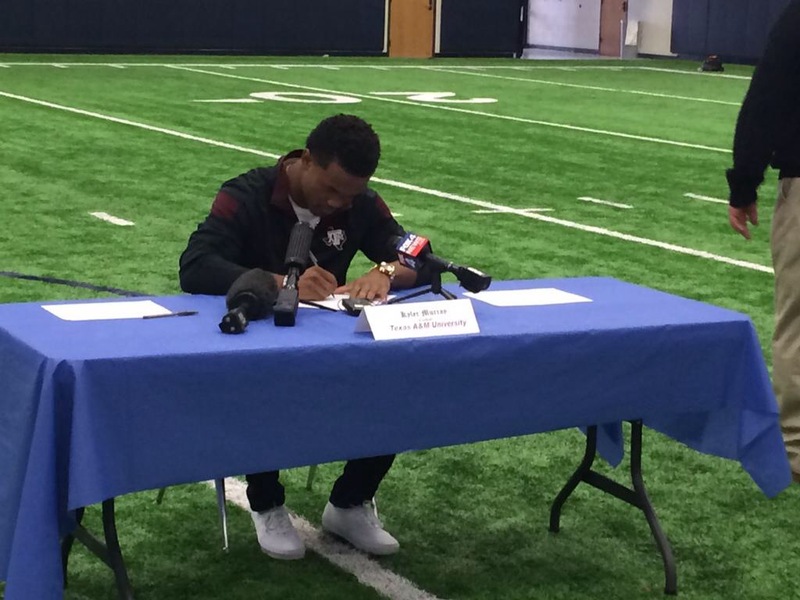 After a dramatic final 2 weeks of recruiting, the Aggies had a relatively quiet signing day. By 9am, 20 of the 25 eventual signees had inked their letter of intent and faxed it to the Athletic Department. But a couple key players remained. 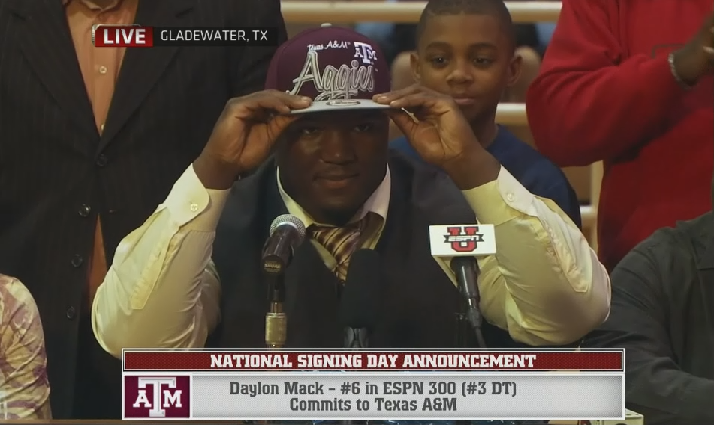 Aggie 5-star commit Kyler Murray was slotted to sign at 10am and Aggie hopeful Daylon Mack was announcing at 11:30. Kyler Murray and his dad, Kevin, arrived late to their press conference setting off a bit of a panic among Aggie fans. However, they were decked out in Aggie gear putting to bed any notion of a last minute flip to Texas. The 5-star standout and Gatorade Player of the Year signed his letter and told the nation “I feel very comfortable with A&M and now I just can’t wait to get down there and put my pads back on.” But with the MLB draft looming and Kyler projecting at a late first round/early second round pick, the roller coaster isn’t over just yet for Aggie fans. With all committed recruits signed, the coaching staff was able to turn their attention to the three uncommitted prospects: LB Roquan Smith, WR DaMarkus Lodge, and DT Daylon Mack. While A&M was the favorite to land Mack, they definitely were playing from behind with Smith and Lodge. Again, no surprises. Smith announced UCLA (although he hasn’t sent in his LOI yet), Lodge followed his former teammate to Ole Miss, and Daylon Mack gave the Aggies his pledge over Texas and TCU. It was the cherry on top of what is yet another exceptional recruiting class for Coach Sumlin. In this recruiting class of 25 players are 14 blue chip recruits (4-stars or better), three 5-stars, and 7 early enrollees. The coaching staff landed two generational players in Kyler Murray and Daylon Mack (fun fact: the pairing of Mack and Myles Garrett will be the first time 2 Under Armour All American MVP’s have ever played together). Five linebackers will add much needed depth with two already on campus (JUCO transfer Claude George and Richard Moore). Last but not least, the Aggies are getting 3 Gatorade Players of the Year from 3 different states; QB Kyler Murray from Texas, WR Christian Kirk from Arizona, and DB Deshawn Capers-Smith from Louisiana. There is much to be excited about with this recruiting class. The Aggies are building depth and talent to compete for championships in the SEC year in and year out! *WR Damion Ratley (3-star recruit) – 6’2” 190lbs. – JUCO Blinn C.C. *LB Claude George (3-star recruit) – 6’3” 230lbs. – JUCO Hutchinson C.C. *S Justin Evans (3-star recruit) – 6’1″ 185lbs. – JUCO Mississippi Gulf Coast C.C.